Naiberi River Campsite and Resort is Located 16 km from Eldoret, 400 meters off the tarmac on the Eldoret-Kaptagat-Eldama Ravine road. Other facilities include; the swimming pool that overlooks the Naiberi River, Dining in the covered yet open-sided sun room with panoramic views of the water ponds, garden and natural forest and this is absolutely fascinating. Naiberi River Campsite and Resort offers various types of accommodation facilities each designed to suit individual choice and lifestyle. They have dormitories, log cabins and executive rooms and a well maintained lush green lawn that is set aside for the campers to pitch up their own tents. 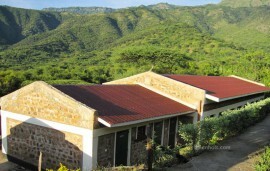 The dormitories at Naiberi River Campsite and Resort are spacious and have en-suite bathrooms. These dormitories are popular with groups that are looking into spending less. 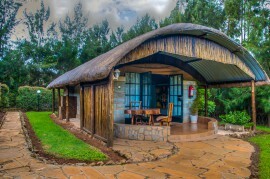 The log cabins and executive suites offer stunning views of the Naiberi River as well as the valley. Whether thinking of a conference or a team building venue, Naiberi River Campsite and Resort is your first choice. 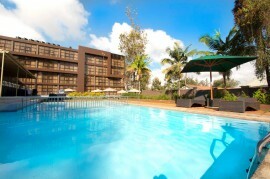 The Resort offers a conference as well as a spacious ground to take up the team building.